Keep food and beverages fresh and colder for hours with our chilled food and beverage servers. Never have to worry about appetizers sitting out or constantly running back to the fridge to replenish a glass of your favorite iced beverage. Choose from a variety of chilled servers to fit your needs. The Chill Out and About Server works as a great food chiller for outdoor parties. Our large assortment of Prodyne iced acrylic ware allows you to find the perfect food or beverage chiller to fit your needs. Keep the parties going all night long by serving fresh food and beverages with the help of our iced serveware and food chillers. This wine bucket feature a stylish ribbed wall, “molded-in” handles and are large enough to hold 2 bottles of your favorite vintage. 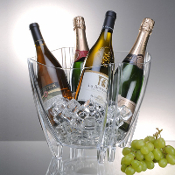 Chill a bottle of wine or champagne in this stylish ribbed acrylic wine buckets. The Chill Out and About stay-cool food serving and storage system is an elegant solution to this everyday entertaining dilemma. 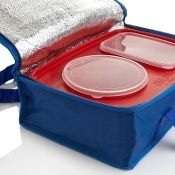 It keeps food fresh for hours at parties or picnics, at home or on the go. 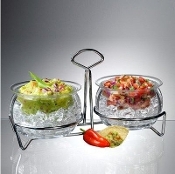 Double Dips On Ice with Caddy // Two Dips On Ice bowl sets complete with stylish, heavy guage chromed metal caddy. 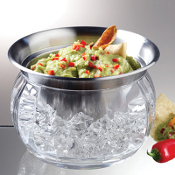 Conveniently carry and serve two dips, condiments or dressings, keeping them chilled and fresh throughout the party. 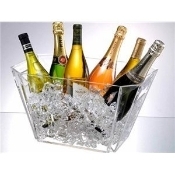 Let the corks fly with this gorgeous party tub featuring 4 sets of handsome double legs. Large tub holds up to 5 wine bottles. Durable clear acrylic is perfect for both indoor and outdoor use. 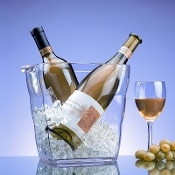 Portage Deluxe Portable Wine Chiller with Liquid Freezing Gel keeps wine cold for hours. 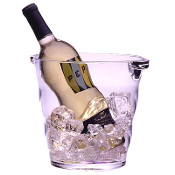 Place coolant filled wien bottle base into freezer first, then take and enjoy your refreshingly cold wine. 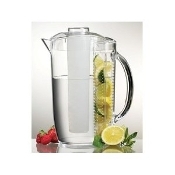 Prodyne Fruit Infusion Pitcher 70 oz Dress up any party with this fine acrylic diamond-cut beverageware. This stunning thick walled pitcher is perfect for all occasions, from formal indoor dining to casual outdoor entertaining. BPA Free. Holds 70... Beautiful new collection of thick wall acrylic pitchers, carafes, tumblers and more. High style design features clear bodies with colorful lids and bases in red, green, clear, blue or orange. BPA free. Pop it up when you need it, and collapse it when you don't--this cooler helps keep your food cold or warm for transport, during a party, or for a day at the beach. Our exclusive insulated Two Liter Jacket from Picnic Plus keeps your beverages cold and prevents container condensation for many hours. The 600D polyester shell with foam insulation and water resistant lining holds a 2 liter plastic bottle. The serving containers nest in ice, while the main tray lid protects the ice from dripping food and the serving containers from becoming unstable. In addition, the attractive design works with all decors and makes for a beautiful presentation. The Chill Out and About Server 8pc Set is an elegant solution to an everyday entertaining dilemma. 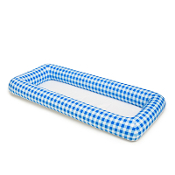 Chill Out and About keeps food fresh for hours at parties or picnics, at home or on the go. This wine cooler keeps wine bottles cold for hours without ice. Bowl with bottom tray for ice, to keep food cold. The Condiments on Ice keeps up to five separate condiments cool for hours. 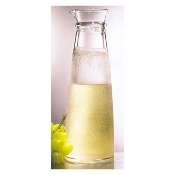 A crystal clear acrylic pitcher with removable fruit infusion rod. 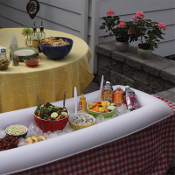 This Acrylic Party Tub holds up to 8 wine bottles or plenty of beer and soda. 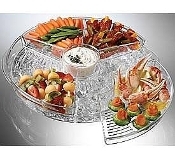 With the Iced Appetizers tray all your appetizers stay chilled and fresh for hours. 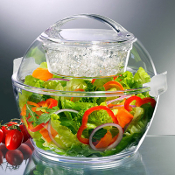 The Iced Salad bowl with lid keeps salads fresh on a bed of ice. 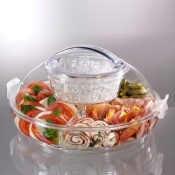 This acrylic serving bowl comes with 4 removable side servers and is great for salads and dips. 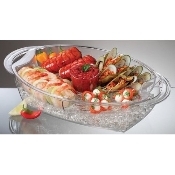 The Prodyne Appetizer On Ice is a multifunctional appetizer serving center. The revolving tray keeps appetizers chilled keeping them fresh and tasty through the party. Serve chilled appetizers all night long with this party host must have. 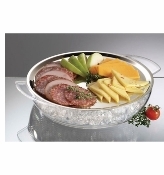 Prodyne Cold Bowl on Ice is the perfect solution to serving cold foods at a party or picnic. 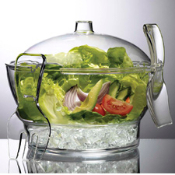 This serving bowl with vented ice chamber is ideal for salads, fruit, appetizers and more by keeping all kinds of food chilled over a bed of ice. The Prodyne Fusion Bottle is tall and good looking, this unique Fusion bottle will add charm and multiple function to any home bar or kitchen. Use as cocktail shaker to shake up great martinis and other exotic drinks. 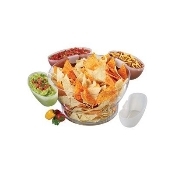 Prodyne Iced Dip holds all of your DIPS, SAUCES, CONDIMENTS AND SNACKS and Keeps Them Chilled On Ice. High quality stainless steel upper dip bowl (22 oz.) nests inside stylish lower acrylic ice bowl. 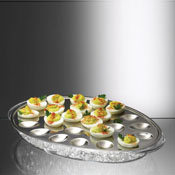 The Prodyne Iced Eggs provide a chilling combination of stainless steel and polystyrene, this beautiful egg platter brings high design and impressive stay cold function to the party. Upper tray hold 24 deviled egg halves. The Prodyne ICED Fruit Infusion lets you enjoy refreshing lemon water, raspberry iced tea and more and keep it cold with this attractive new combo pitcher. The Prodyne Server On Ice w/Dome will keep all your food delights chilled and fresh on a bed of ice. 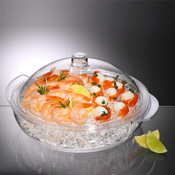 This attractive three piece set features a vented upper food platter, a lower ice tray and a dome lid. 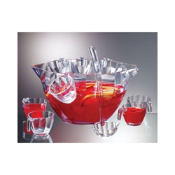 This acrylic bowl seves as both a salad or punch bowl. 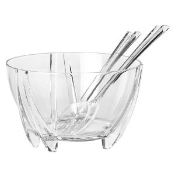 Keep salads and fruit chilled and fresh with this unique acrylic salad bowl featuring a vented ice chamber bowl. Thank you for browsing out Chilled Serveware collections. Please come again to see our newest food and beverage chillers.